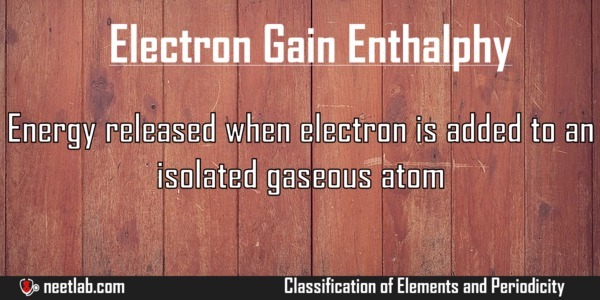 Electron Gain Enthalpy(EGE) is the energy released when electron is added to an isolated gaseous atom. Atom Size – In smaller atoms, incoming electrons are placed closed to the nucleus. So addition becomes easy. Nuclear Charge – Higher nuclear charge attracts the incoming electrons making it easy. Type of sub-shell – The order of the electron gain enthalpy for the sub-shells is s > p > d > f. Higher the sub-shell, higher the number of electrons it can accommodate. Lower sub-shells are packed tightly whereas the higher sub-shells are packed loosely because of the high number of electrons it accommodates. Electrons added to higher sub-shells face lesser repulsion from the existing electrons in that sub-shell. Electronic configuration – Fully-filled and Half-filled electrons in outermost shell have extra stability. Atoms which require electron to achieve fully-filled and half-filled status accommodates the incoming electrons with less energy. Electron Gain Enthalpy is opposite of Ionisation enthalpy. When an electron is added to an atom, energy is released. The added electrons faces repulsion from the existing electrons but it gets support because of nuclear attraction. When energy is required to add an electron, it is called as positive electron gain enthalpy. 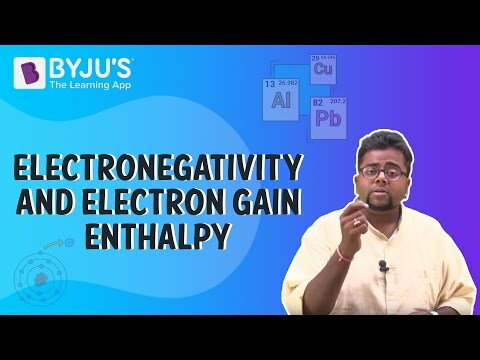 When energy is released during addition of electron, it is called negative electron gain enthalpy. Variation of electron gain enthalpy in period: When we we move across the period, the atomic radius(click this link to know why it decreases) decreases making it easy to add electrons because of higher nuclear force attraction. Variation of electron gain enthalpy in group: When we we move down the periodic group, the atomic radius increases making it difficult to add electrons because of less nuclear force attraction. Less energy needs to be spent to add electron for elements with higher atomic size. Elements of 1st and 2nd group show less negative EGE values because they prefer to lose electron to achieve fully-filled configuration than losing electron. Elements of 18th group (noble elements) have large positive EGE values because they are in fully-filled state. The electron gain enthalpy is not as symmetrical like Ionization enthalpy because it is dependent on many factors. What is the value of electron gain enthalpy of Na+ if IE₁ of Na =5.1 eV ?